Citation: C N Trueman "Double VC winners"
Only 3 men have won two VC’s in the history of the medal. The double VC holders were Surgeon Captain Arthur Martin-Leake, Captain Noel Chavasse and Captain Charles Upham. Surgeon Captain Arthur Martin-Leake died in 1953 aged 79. Captain Noel Chavasse won two VC’s in World War One. Qualified as a doctor, Chavasse joined the Royal Army Medical Corps (RAMC) when World War One broke out. His unit of the RAMC was attached to 10thBattalion King’s (Liverpool) Regiment which fought at the Battle of Hooge near Ypres in 1915. The ferocity of this battle was such that out of 900 men in the 10th battalion just 140 men and 2 officers survived. 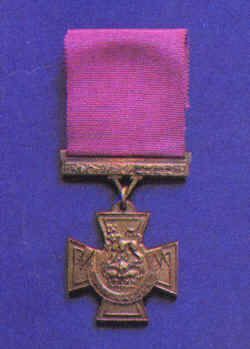 For his gallantry, Captain Chavasse was awarded the Military Cross. On Day 1 of the Battle of the Somme, the battalion was ordered to attack the fortified village of Guillemont. Along with many other units, the 10thbattalion suffered major casualties. Chavasse tended as many of the wounded as he could even into the night- time. He was hit by shrapnel twice and on one occasion carried a wounded man 500 metres back to safety. Chavasse also collected as many dog tags as he could of men killed in the attack. The citation for his first VC stated: “Altogether he saved the lives of some twenty badly wounded men, besides the ordinary cases which passed through his hands. His courage and self-sacrifice were beyond praise.” Chavasse received his VC from King George V in February 1917. Chavasse was buried in the military cemetery at Brandhoek in Belgium. His headstone is the only one in the world engraved with two VC’s. Captain Charles Upham won his first VC for outstanding leadership and courage during fighting in Crete in May 1941. Despite being wounded by a mortar shell, he carried a wounded man back to safety. Eight days after this, he killed twenty-two Germans with a sub-machine gun during an attack. In 1942, Upham, fighting in North Africa, captured a German position, destroying a tank and several vehicles with grenades despite his injuries. His arm had been shattered by a machine gun but he only stopped fighting when blood loss made him faint. Only then did he have his wounds dressed. Regardless of his wounds, Upham stayed with his men, continued to fight and suffered further injuries. He died in New Zealand in November 1994, aged 86.